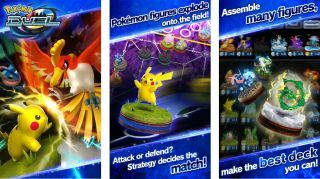 Update: Pokémon Duel is out now – the servers are up and running for both the iOS and Android versions of the game. So make sure you check out our Pokémon Duel tips and tricks how-to. Original: Done with Pokémon Go? There's a surprise game ready for your phone that hasn't previously been officially announced by The Pokemon Company. It was originally released a year ago in Japan under the title Pokémon Comaster, but it's now being rolled out in the US and UK under the title Pokémon Duel. Duel isn't anything like Pokémon Go – you can play this from the comfort of your living room. However, it's not like a traditional Pokémon game either. Instead, it's a strategy board game using the Pokémon characters. You have a collection of virtual figures to collect and use, each with different powers. You can then fight these figures with opponents from around the word. The official iOS listing reads, "Build a deck with your favorite figures and then leap into a League Match! Compete with players from around the world for a chance to enter the top League rankings in League Matches. "You'll fight your rivals in real time! Win duels, get all kinds of cool figures and items, and make your deck stronger!" It's out now on both iOS and Android. Earlier when we tried to download it in the UK to devices on either OS we were met with server maintenance issues, but it should be up and running soon. Download it now - there's a lengthy install process once you download the initial files - and you'll soon be ready to play this brand new Pokémon game.